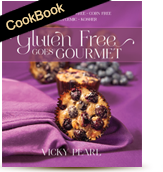 This introduction describes those ingredients that are essential to success in the gluten-free kitchen—a kitchen is really not so different from any other, except for some unique items that require explanation. I often explain to my newly diagnosed clients that most of what they already eat for breakfast, lunch, and dinner can easily be incorporated into an overall healthy gluten-free diet. A quick skim of the following pages will assure you of this truth. Healthy salads and soups, many main dishes, and of course fruits and vegetables of all kinds do not contain gluten. It’s when you want a special treat or something different for breakfast or you want to thicken a sauce, for example, that specific knowledge and specific products come into play. This entry was posted in Pantry, Sweeteners on Aug 18, 2013 by Vicky Pearl. This entry was posted in Pantry, Sweeteners on Aug 17, 2013 by gfbyvickypearl. This entry was posted in Sweeteners on Aug 16, 2013 by gfbyvickypearl. This entry was posted in Sweeteners on Aug 15, 2013 by gfbyvickypearl. This entry was posted in Sweeteners on Aug 14, 2013 by gfbyvickypearl.